At the end of the twenty-first century, in a transformed America?the families of convicted felons are tested for a set of genetic markers. Boys who test positive become compulsory wards of the state, removed from their homes and raised on "Goodhouse" campuses, where they learn to reform their darkest thoughts and impulses. Goodhouse is a feral place, part prison, part boarding school and now a radical religious group, the Holy Redeemer's Church of Purity, is intent on destroying each campus and purifying every child with fire. We see all this through the eyes of James, a transfer student who watched as the radicals set fire to his old Goodhouse and everyone he'd ever known. In addition to adjusting to a new campus with new rules, James now has to contend with Bethany, a brilliant, medically fragile girl who wants to save him, and her father, the school's sinister director of medical studies. Soon, however, James realizes that the biggest threat might already be there, inside the fortified walls of Goodhouse itself. 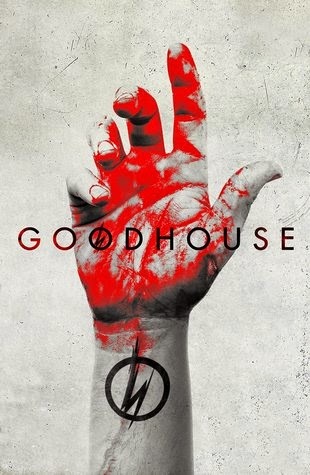 Partly based on the true story of the nineteenth-century Preston School of Industry and the boys who lived and died in its halls, Goodhouse explores questions of identity and free will and what it means to test the limits of human endurance. So, I hadn't heard of this book before it arrived from Penguin Books for review. The blurb on the back cover made it sound interesting. Unfortunately I wasn't very impressed. Even tho it has an interesting premise, it left me feeling mostly unsure of what it was supposed to be about or what feelings it was trying to evoke. I was too confused for the first half of it to really bond or care about the characters. There were obviously bad things happening, but I didn't really grasp why. Power corrupts? Yip, great, I got that already. All in all, I wouldn't recommend you bother with reading this. Honestly, I didn't find it page-turning or much of a thriller. @MeeA Oh yes, I've seen that blog. Sadly this isn't all that much about the reform school experience at all (I didn't think). In fact I can't remember them mentioned a single class being attended ... just work details after hours (amongst other things) as some kind of punishment.